I am curious to see what a movable pigloo looks like!!?? It sounds like a uniquely Canadian invention. We have plenty of space for grazing pigs, but I am always held up by figuring out cheap, portable housing. Good question, and to some extent it depends on climate and if you are operating seasonally or not. I use a home-made truck camper that I found at a farm auction 6 or 7 years ago . As I recall it cost me $2, 'cause it was UGLY. But the pigs loved it. 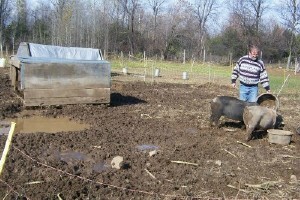 Its about 6 x 8 feet, and I have had a many as 8 pigs sheltered in and around it. This works for me because I raise my piggies in the snow-free months, from April to October in my neck of the woods. The shelter mostly provides them shade and gives them a dry place to sleep if it rains. Any simple structure that provides shade will do the trick. The challenge is to keep it strong enough to hold up to big pigs but light enough to move. The a-frame style looks like it might be adapted to be more portable for seasonal use e.g. leave off the door, and don't put a floor in it. If there is any interest I might design and build a new shelter for my piggies this season, the old camper is getting pretty beat up after 6 years and 50 pigs or so. If so I will put pictures up on my site.